Born in Lisbon, Maria had the first contact with dance at the age of 13. 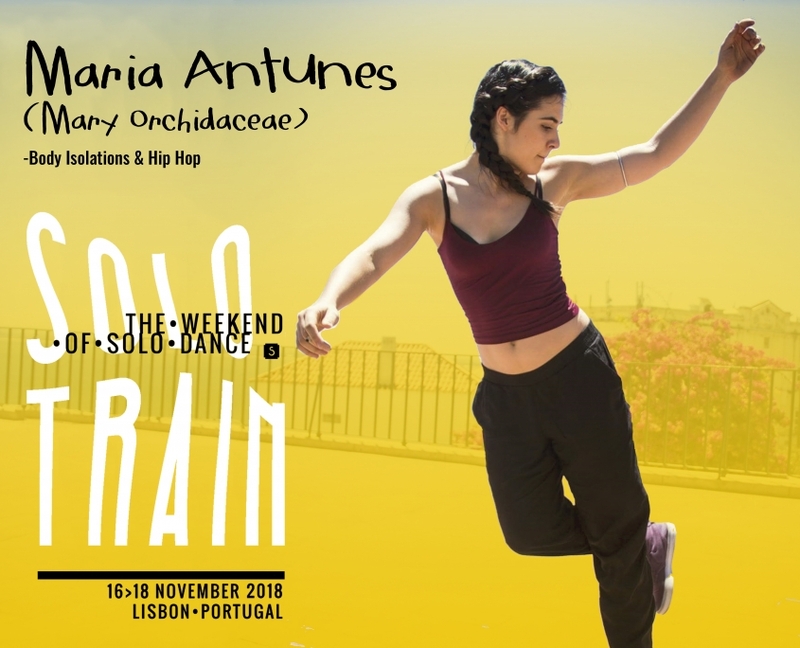 She did her Bachelor’s Degree in Contemporary Dance at the Escola Superior de Dança (Lisbon), where she gained classical and contemporary training (2013/2016). This year she finished FOR Dance Theater in Companhia Olga Roriz in Lisbon (2017/2018). From her training, she highlights several national and international names such as Archie Burnett, Brian “Footwork” Green, Buddha Stretch, Henry Link, Poppin Pete, Marjory Smarth, Kapela, Ice-e, Tentacle Tribe, Chris Martin, Leo and Zoe Melody, Laure Courtellemont, Hugo Marmelada, Leo Ramos, among others. In 2014 she joined the company “Orchidaceae Urban Tribal” where she traveled to countries such as France, UK, Sweden, Spain and Italy. She has worked as a dancer for advertisement: MTV Portugal, Sagres, Bimby, Continente, TAP – Companhia Áerea, SIBS, MonaVie, Martini, Destak, SportZone, among others. She’s also participated as a dancer in video clips of: TT, David Carreira, among others. She joined the Top 20 – “So You Think You Can Dance?” – second edition of the SIC television program. Presently, she’s also working as a Hip-Hop, House and Contemporary teacher. Nascida em Lisboa, a Maria teve o primeiro contacto com a dança aos 13 anos. Licenciou-se em Dança Contemporânea na Escola Superior de Dança (Lisboa), onde teve formação em dança clássica e contemporânea (2013/2016). Este ano terminou o FOR Dance Theater na Companhia Olga Roriz em Lisboa (2017/2018). Da sua formação, ela destaca vários nomes nacionais e internacionais, como Archie Burnett, Brian “Footwork” Verde, Buda Stretch, Henry Link, Poppin Pete, Marjory Smarth, Kapela, Ice-e, Tribo Tentacle, Chris Martin, Leo e Zoe Melody , Laure Courtellemont, Hugo Marmelada, Leo Ramos, entre outros. Em 2014 ingressou na companhia “Orchidaceae Urban Tribal”, onde viajou para países como França, Reino Unido, Suécia, Espanha e Itália. Já trabalhou como bailarina em publicidade: MTV Portugal, Sagres, Bimby, Continente, TAP – Companhia Áerea, SIBS, MonaVie, Martini, Destak, SportZone, entre outras. Ela também participou como dançarina em videoclipes de: TT, David Carreira, entre outros. Ela se juntou ao Top 20 – “Achas Que Sabes Dançar?” – segunda edição do programa de televisão SIC. Atualmente, ela também trabalha como professora de hip-hop, house e contemporânea.